Interviews and musings on the intersection of ART and SCIENCE. Saturate Incubate Illuminate Verify The mysterious edge of discovery for artists and scientists. Early in January I had the new-year joy of sitting with Peggy Baker to talk about her upcoming show SplitScreen at Theatre Centre. A clear, crisp day of fresh month, Church street seemed cleaner and brighter as I headed over to the National Ballet School, where she and her company are resident, to meet with her. Peggy was just emerging from Christine Wright’s ballet class for contemporary dancers (a program spear-headed by Peggy Baker Dance Projects), and we headed up to her office, lined with books and a smattering of gorgeous posters on the walls. I have known Peggy for a long time now, but I still get a little nervous when we talk. 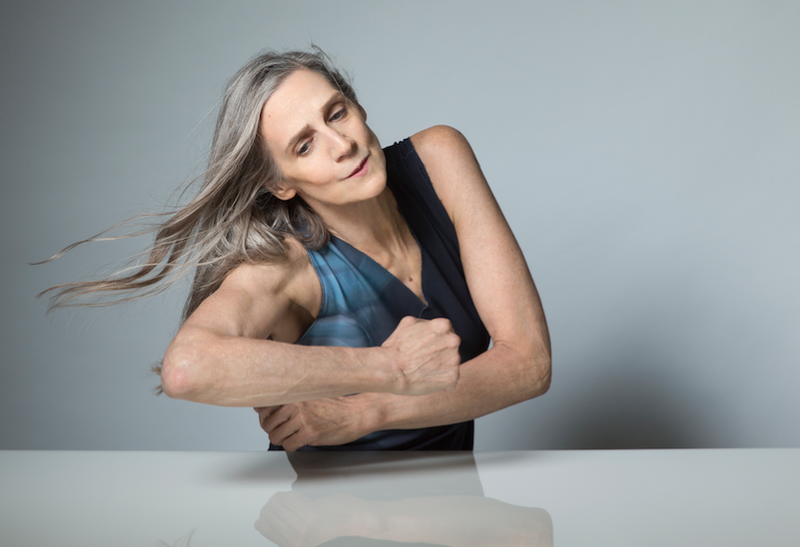 The clarity and precision of her thoughts possess the same clarity and precision of her choreographic works, with a beautiful layer of warmth as well. Wisdom in motion. P: I subscribe to the New Yorker and what I really appreciate about that magazine is the volume of conversation about literature of all kinds, dance of all kinds, art of all kinds. Dance resides right in there with political commentary and science and cartoons…It’s really where dance is, part of the world. L: It needs to be talked about in amongst other things. P It stimulating, exciting, nourishing to read it in that way. It’s a struggle in this country for this kind of holistic view. L: Speaking of a holistic view….I was reading about the program for your upcoming show…. What was the impetus or spark to put those pieces together…it’s a mixed program, but it’s not. P: No, it’s not a variety pack….Well….The move to a new [theatre] space ….I did my first show in 1991 at the Betty Oliphant Theatre, then for a while I was at the Fleck Theatre, then I went back to the Betty O. They are both conservative spaces, a really old format that’s very successful. Proscenium staging is amazing, like a fantastic sound studio. There were pragmatic issues about the theatre, the main one is that it’s a teaching studio so if you are presenting there you have to dismantle your show everyday. My shows have been getting pretty complicated staging-wise and the last time we were there, it was frightening to pull apart the level of technical we had every night…. L: And Theatre Centre, where SplitScreen is happening is an outstanding place. The leadership and values are apparent in the actual bricks and mortar there! P: Toronto has been lacking a place like this for many years. It’s important to me to try to find my integration in our community. We [the dance community] are at a disadvantage because we don’t have a central meeting place or presenters who champion local creators. I’ve been separate because of the location of presenting my work. Theatre Centre puts me in a neighbourhood that’s alive with ideas and images and activity and art. So why did I choose these works…. Not presenting anything new was pragmatic as I’m working towards a very big project so I had to budget my resources this year. I felt like one of the things that’s been happening and I’ve been questioning is the utter disposability of everything we make. 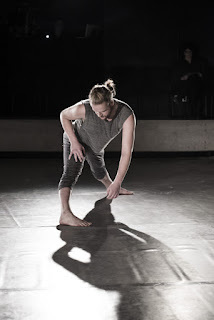 I wanted to bring together works that I felt had some resonance with one another and were strong in their own right, with a good balance between male and female and in the Theatre Centre space to could offer an intimate experience with the performers. I wanted works that require great artistry, that are substantial as a choreographic works and as I put them together a pathway through these works emerged…. Opening with a woman alone on stage. That’s how I’ve spent much of my career…You understand that incredibly vulnerable position. P: Then to look at two men. Ric Brown and David Norsworthy. Ric is almost twice the age of David…at opposite ends of their career arcs. They are thoroughly unique. The material very available for David at his age and a triumph for Ric as an older dancer. L: I don’t know Ric at all, but when I see him in person or dancing he has an almost angelic energy. P: He is completely open, uncluttered. And next in the program is Split-Screen. I really love Split Screen Stereophonic….I don’t know if this is literally true…but I don’t know that I had choreographed about intimate relationships before this piece. Of the original dancers -- Ben Kamino, Sahara Morimoto, Sean Ling and Sarah Fregeau -- Sarah’s the only one I have this time. So it’s been really interesting and great to shift it so much. The chemistry is very, very different. It’s a kind of evidence of the strength of the composition. I’ve set out to make works that compositionally have the strength and flexibility of something like a musical score or a play so that it’s only the choreography. It requires artists to enter it and create performances. They are both necessary and strong: the composition and the performance. Then as a companion piece to Split Screen Stereophonic, I made Epilogue. So through the whole arc of SplitScreen we have a balance of vulnerability and virtuosity, a blast of a flip side with the men, then into relationships and then a lone woman again. A woman at a different point in her life than the opening woman. L: Women who are dancers. They have to be dancers….What made you want to return to performance? P: I feel very in command of the demands of Epilogue. It’s still very close to the bone for me. Until I’ve really completed all my personal quandaries around it, I’ll do it. And I’m not sure it belongs outside the Split Screen Stereophonic context. Not every piece needs to go on. Some of my solos have relevancies outside of my necessity to make them, some of them don’t. L: I know what you mean. I don’t have the same span of career as you, but I’ve found already that some of the solos I’ve made, some of the ones I love to dance, the reasons don’t arise to do them again. Others do. They have more opportunities. It’s hard because some are really in the heart, they were epic and hard to make and they may never happen again and I have to be okay with that. It’s kind of the flip side of the disposability you spoke of before. On to something else. There is always something structural, architectural about your work….a description in your materials about “lines of action” struck me. It’s not about the structure sitting there, but alive through action. The structure is an emotional structure or one that can be felt, lived by the dancers emotionally. P: I came to dance through theatre, so that’s my primary point of entry. Character, situation, relationship….something needs to be going on. We need conflict. If nothing goes wrong there’s nothing. Where’s the complication? the difficulty? the misunderstanding? And yet I’m pretty abstract in my way of going at it. I love the physical character of the work. But there’s always subtext. Motives. Everything can’t be spoken for, otherwise there’s no room for the dancers to create, to be spontaneous. All those things that are available to you when you dance your own work because you can make those decisions and responses as you go-- I am wanting to make similar situations for my dancers, to make work that always has room, that creates room for the artists. Dancers want great work to be inside of….it’s that feeling of watching it and wanting to be inside it that dancers get. That’s great resonant work. L: I have that feeling all the time, but I hadn’t thought of it that way. The movement seduces me, because I just want to be dancing all the time. But I think it’s actually the journey that’s happening inside the movement that really grabs me. It’s the whole world. P: It is movement too. And it requires a dancer. It requires an artist who is a dancer. L: It’s funny when I see plays I don’t want to be in them even though I’ve been involved in theatre for more than 15 years. But dance does it for me because it is the movement. I am a bit addicted to moving. P: SplitScreen is hard for me because I can’t watch this show -- I’m in it. I can’t quite know how it functions in performance. Being outside the work over the last few years I’ve learned so much. But I can’t with this show because I have to look after my performance. Once I hit the time for me to prepare for my performance, that’s it. P (laughing): I don’t have that twitchiness anymore. That’s already made itself clear. I’m no longer a dancer but I sometimes still perform. I’m the ruin of a dancer. I could only be what I am now if I had been a dancer. Even if someone else could do the things I can do I’m not sure I’d buy it. I just know that all of that investment we make in our physical practice makes a different kind of performer. L: You have sort of talked about this a bit already…. But how has your choreography evolved? P: An accelerated evolution. I’m looking with incredible kinesthetic memory. From what I’m feeling in my body and what I’m seeing and the impulses of my dancers. Before it was my own kinetic impulses….I didn’t expect to be a choreographer at this time in my life, but I wanted at first to experiment with working with other people with the same tools I used on myself. After a somewhat lurching entry during which I learned a huge amount, something started. My own drive to make took over. Before it was always self-exploration…. L: When do you feel that switch started to happen? P: It happened when I came home from rehearsing with the dancers one day and felt really happy. I realized I hadn’t felt like this since I was really in my body. P: The last six or seven years. It was with Coalesce (2010)….it got me excited. I was learning, I was growing. I couldn’t wait to go back into the studio. It was the same feeling I had in my dancer life. L: Since I had that mentorship grant a few years ago and you sat with me in my renovation-ridden house and you gave me some breathtaking advice, I associate you with generosity – resources, information, spirit. How do you keep yourself so generous? P: Oh my goodness….well I’ve been the recipient of such tremendous generosity….I come from a big family. I learned how to share and take pleasure in sharing. I love being part of a community, a network that’s healthy and vibrant. The more any artist here succeeds the better it is for everybody. I want to see our community blossom. I want dance to be a great milieu. It requires everyone to contribute to that possibility. I want to do that. I want this to be a great place for dance. There’s some stuff in the way but we shouldn’t be in our own way. L: I’m glad I have this recorded because I can listen to it again and again to feel re-inspired and rooted. Sarah Slean's poem for my dancework "The Abecedarian". A - amelia earheart yearning to fly. awe flowers open in her dreaming eye. like the long and constant exhale of the sky while the monk at his table, is writing. B - what you reach for is already there, in your hand, you may think we are birds condemned to the land, but somewhere eternal, beyond feeble sight. the gravity creature is always in flight. Does baby really enjoy my dancing? He/she only kicks when I stop moving, never protests while I'm going. The only protests are occasional quiet shrieks from my abdominal muscles. On Thursday I was part of Buzz at Theatre Passe Muraille working with Theatre Rusticle and though I have performed with fetus before, this performance was more emotionally, physically and intellectually intense than other performances. When I got home and was winding down, I learned something the fetus-adrenalin relationship. Suddenly a karate class was taking place in my belly. Baby has been moving around and kicking lots in the last few months, but this was incredible. I was drifting to sleep, but baby was on an adrenalin high. In my mind's eye I could see the little thing yanking on the umbilical cord saying "More! more!"